Monopolists of the Genetic Code? 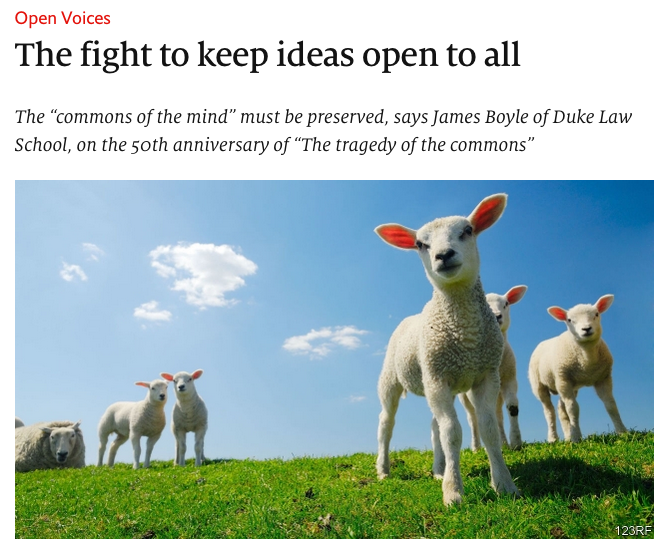 The Economist was kind enough to ask me to write an article commemorating the 50th anniversary of Garrett Hardin’s Tragedy of the Commons. ““THE ONLY way we can preserve and nurture other and more precious freedoms is by relinquishing the freedom to breed.” This ominous sentence comes not from China’s one-child policy but from one of the 20th century’s most influential—and misunderstood—essays in economics. “The tragedy of the commons”, by Garrett Hardin, marks its 50th anniversary on December 13th.” Read the rest here. (When) Is Copyright Reform Possible? I am posting here a draft of a chapter for Ruth Okediji’s forthcoming book on the possibilities of international intellectual property reform. In my case, the article recounts the lessons I learned from being part of the Hargreaves Review of Intellectual Property in the UK. 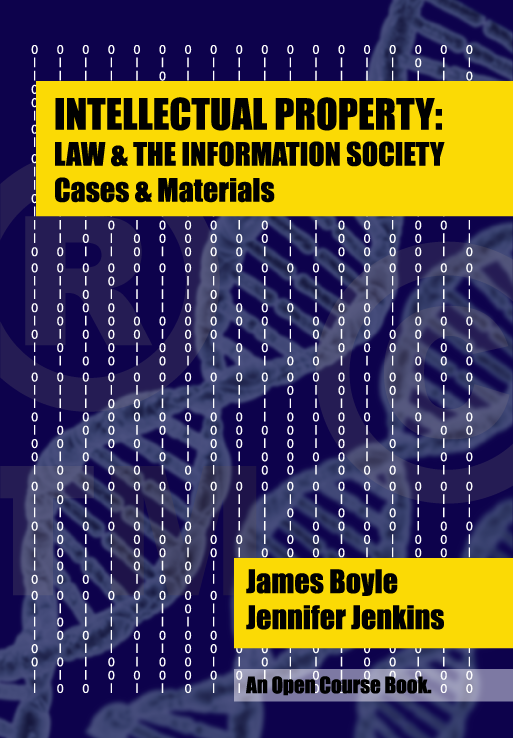 Duke’s Center for the Study of the Public Domain is announcing the publication of Intellectual Property: Law & the Information Society—Cases and Materials by James Boyle and Jennifer Jenkins. 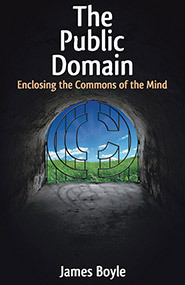 This book, the first in a series of Duke Open Coursebooks, is available for free download under a Creative Commons license. If you do not want to use the entire casebook you can view and download the individual chapters (in a variety of formats) here. It can also be purchased in a glossy paperback print edition for $29.99, $130 cheaper than other intellectual property casebooks. So you’ve invented fantasy football, now what? We are posting excerpts from our new coursebook Intellectual Property: Law and the Information Society which will be published in two weeks is out now! It will be is of course freely downloadable, and sold in paper for about $135 less than other casebooks. (And yes, it will include discussions of whether one should ever use the term “intellectual property.” ) The book is full of practice examples.. This is one from Chapter One, on the theories behind intellectual property: “What if you came up with the idea of Fantasy Football?” No legal knowledge necessary. Why don’t you test your argumentative abilities…? Today, we are proud to announce the publication of our 2014 Intellectual Property Statutory Supplement as a freely downloadable Open Course Book. It offers the full text of the Federal Trademark, Copyright and Patent statutes (including edits detailing the changes made by the America Invents Act.) It also has a number of important international treaties and a chart which compares the various types of Federal intellectual property rights — their constitutional basis, subject matter, length, exceptions and so on.You can see it here in print, or download it for free, here. This is the fourth in a series of postings of material drawn from our forthcoming, Creative Commons licensed, open coursebook on Intellectual Property. It is about lawyers and language. Macaulay’s 1841 speech to the House of Commons on copyright law is often cited and not much read. In fact, the phrase “cite unseen” gains a new meaning. That is a shame, because it is masterful. (And funny.) One fascinating moment? When Macaulay warns that copyright maximalism will lead to a future of rampant illegality, as all happily violate a law that is presumed to have lost all moral legitimacy. At present the holder of copyright has the public feeling on his side. Those who invade copyright are regarded as knaves who take the bread out of the mouths of deserving men. Everybody is well pleased to see them restrained by the law, and compelled to refund their ill-gotten gains. No tradesman of good repute will have anything to do with such disgraceful transactions. Pass this law: and that feeling is at an end. Men very different from the present race of piratical booksellers will soon infringe this intolerable monopoly. Great masses of capital will be constantly employed in the violation of the law. Every art will be employed to evade legal pursuit; and the whole nation will be in the plot… Remember too that, when once it ceases to be considered as wrong and discreditable to invade literary property, no person can say where the invasion will stop. The public seldom makes nice distinctions. The wholesome copyright which now exists will share in the disgrace and danger of the new copyright which you are about to create. The legal change he thought would do that? Extending copyright to the absurd length of life plus 50 years. (It is now life plus 70). Ah, Thomas, if only you could have been there for the Sonny Bono Term Extension debates. This is the second in a series of postings of material drawn from our forthcoming, Creative Commons licensed, open coursebook on Intellectual Property. The first was Victor Hugo: Guardian of the Public Domain The book will be released in late August. In 1906, Samuel Clemens (who we remember better by his pen name Mark Twain) addressed Congress on the reform of the Copyright Act. Delicious. 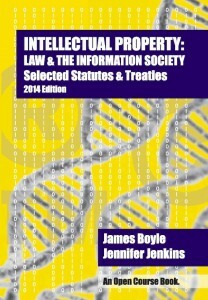 Jennifer Jenkins and I are frantically working to put together a new open casebook on Intellectual Property Law. (It will be available, in beta version, this Fall under a CC license, and freely downloadable in multiple formats of course. Plus it should sell in paper form for about $130 less than the competing casebooks. The accompanying statutory supplement will be 1/5 the price of most statutory supplements — also freely downloadable.) More about that later. While assembling the materials for a casebook, one gets to revisit the archives, reread the great writers. Today I was revisiting Victor Hugo. Hugo was a fabulous — inspiring, passionate — proponent of the rights of authors, and the connection of those rights to free expression and free ideas. Today is the second day of “Copyright Week!” Talk about a lede. That sentence has all the inherent excitement of “Periodontal Health Awareness Week” or “‘Hug Your Proctologist! No, After He’s Washed His Hands’ Week.” And that’s a shame. Copyright Week is a week devoted to our relationship with our own culture. Hint: things aren’t going well. The relationship is on the rocks. Professor Alex Sayf Cummings, author of a fascinating book called Democracy of Sound: Music Piracy and the Remaking of American Copyright in the 20th Century (recommended as a thought-provoking read) has an interesting post up about attempts to shut down music lyric sites such as Rapgenius.com. Academics (and others) arrange conferences. Perfectly normal people are invited to those conferences to speak. Most of them are just as charming as can be… but then there are the special ones. This Top 10 List of the special people one has to respond to is devoted to all conference planners everywhere. Hold your heads up high. After this, purgatory should be a snap. 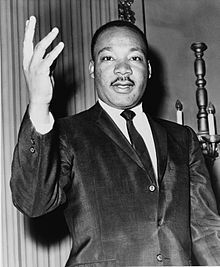 August 28th, 2013 is the 50th anniversary of Martin Luther King’s “I Have a Dream” speech. The copyright in the speech is administered by EMI, with the consent of the King family. Thus the speech may not be freely played on video or reproduced and costlessly distributed across the nation — even today. Its transient appearance depends on the copyright owner’s momentary sufferance, not public right. It may disappear from your video library tomorrow. It has even been licensed to advertise commercial products, including cars and mobile phone plans. Aaron Swartz committed suicide last week. He was 26, a genius and my friend. Not a really good friend, but someone I had worked with off and on for 11 years, liked a lot, had laughed with frequently, occasionally shaken my head over and deeply admired. A slideshow and downloadable book remembering Keith in words and pictures. You can order a glossy, high quality copy of the book itself here from Createspace or here from Amazon. We tried to make it as beautiful as something Keith would create. We failed. But we came close; have a look at how striking it is… all because of Keith’s art. Our friend, colleague, co-author and brilliant artist and scholar Keith Aoki died yesterday in his house in Sacramento. He was 55 years old. The Future of the Constitution? The Brookings Institution has organized a volume on “The Future of the Constitution” edited by Jeff Rosen and Benjamin Wittes and featuring articles by me, Larry Lessig, Jonathan Zittrain, Tim Wu and many others. How will our constitutional tradition deal with the challenges posed by new technologies? The topics range from possible personhood claims by artificial intelligences, to the future of free speech and the Net, to neuroscience and criminal punishment. The essays are freely available online. Details after the jump. My new FT column is up. Shakespeare, copyright, Scott Turow and a shadowy group of law professors.. What could be more fun? Ungated version after the jump. What Could Have Been Entering the Public Domain on January 1, 2011? Nora Young and the folk at CBC’s Spark have done it again, with a really nicely presented episode that includes a feature on copyright. Nora interviews me about the history of copyright… in 5 minutes. This site's contents, except where otherwise indicated, are under a CC Attribution License.